I’ve read with excitement about the rare influx of snowy owls to our region this year. The Journal reported that a pair were even spotted a few weeks ago on San Juan Island! At 24" tall, the snowies are our largest North American owl. Arctic summers have daylight almost 24-7 and the owls are equipped to hunt in the daytime. Most of the time they live in the Arctic, but every four to six years the young ones fly south looking for food. This irruption cycle happens when their main food source (lemmings) surge in population and the owls have more babies than the environment will support. When I heard large numbers of these magnificent raptors were hanging out at Boundary Bay Regional Park just 20ish miles north of Orcas (as the owl flies), I jumped at the first opportunity to hop across the border. Boundary Bay is about a three hour drive from Anacortes. We went on a weekday and our border crossing wait time was only 10 minutes. The bloggers were all saying the best place to see the owls is on the Dyke Trail 72nd Street access point, so that’s where we headed. Sure enough, just a few steps from the parking area there was a group of owls — called a ‘parliament’ – hanging out on driftwood about 30′ from the trail. Farther away we could see several other groups and solitary owls. We spent a few wonderful (and chilly) hours at the park while I got my owl fix. We also saw numerous eagles, hawks and herons. But oh those owls with their captivating yellow eyes. What a treat to see these creature. Here are a few shots by my photographer husband, Bob. Enjoy! Well it doesn’t happen very often, but when it does, it’s wonderful. The already relaxed winter pace stops abruptly in its snow-tracks, leaving us to cozy by our woodstoves, sip a steamy drink, read a coveted book, check on neighbors and marvel at the scene around us. The evergreen island you thought couldn’t possibly get more beautiful dons her white lace gown and simply takes your breath away. She doesn’t overstay her welcome – just long enough to shake up your routine in a good way, making time for introspection and new perspectives on the natural world. I love it. I wanted to take photos around the island this week, but with the exception of a few shots on Sunday before “the storm,” it wasn’t meant to be. The steep road in our neighborhood was relegated to makeshift sleds, and my exploration limited to foot travel. If you have some pics you’d like to share, please post them! We’ve had such a mild start to our fall/winter season it has left many of us cleaning the garden in late November early December. I love the clean up and putting the beds to rest for the winter just as much as I enjoy the planting in the spring. The planning of the next season’s bounty is always in my head any time of the year. 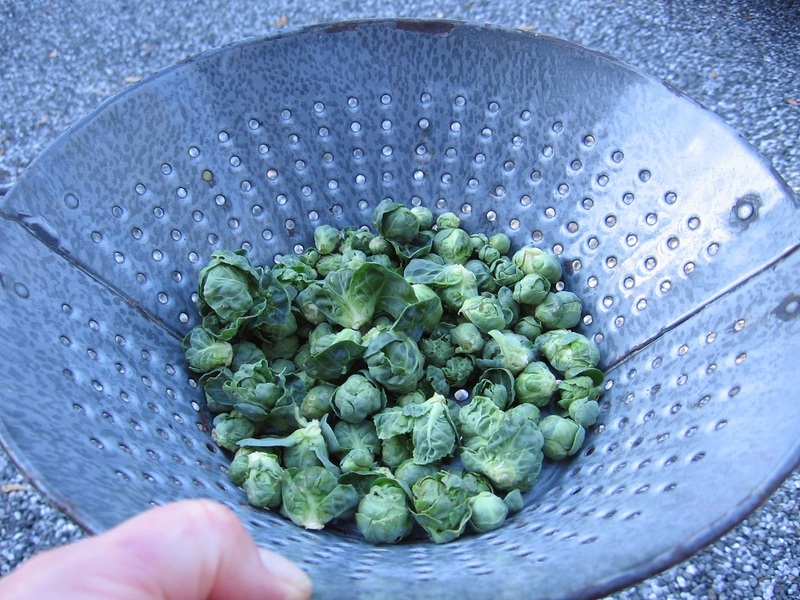 I love Brussels sprouts and had a large crop, almost by accident last year. This year I planted many starts, thinned and spread them throughout my raised beds and dreamed of roasted gems for Thanksgiving. Well you can see here my harvest included a hand full of pea-size sprouts. Most plants had no signs of little cabbage heads popping out. What a disappointment, but I decided to cherish the one meal I would have. I sautéed these little guys in olive oil, garlic, salt and pepper and topped a bowl of quinoa with them-yum. I wish I had a bag full of thee sweet garden treats and I’ll be picking next year’s crop while they are still young. Always optimistic about the next years bounty! Preheat oven to 375. Toast sunflower seeds (careful, this is usually where I burn somethingJ). Set aside to cool. Meanwhile stir mustard, lemon juice, salt and maple syrup together in a small bowl; whisk in oil until emulsified. 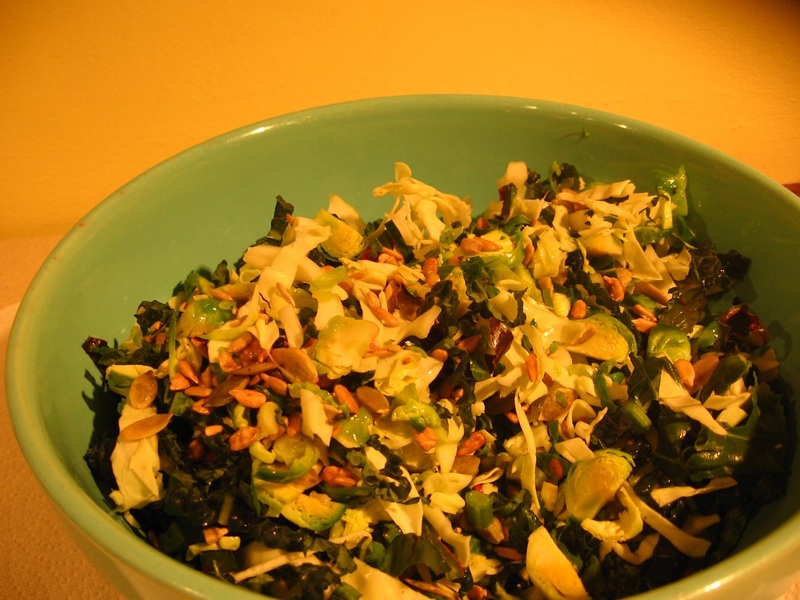 Thinly slice Brussels sprouts and leafy greens, toss together, add seeds and pour in dressing; toss to coat. Serve immediately. Serves 4; total time 15 minutes. You can play with maple syrup, salt and lemon juice to find your taste. If you add apples, they will add sweetness. I’ve also added other favorite seeds. I was really looking forward to this year’s homemade gifts. Every year I try to create a gift that will be unique and meaningful to the receiver. Not always an easy task! The benefit for me, besides the joy of giving, is having my thoughts go to the person. I recall memories, shared times together, likes, dislikes and the energy that person gives from their heart. 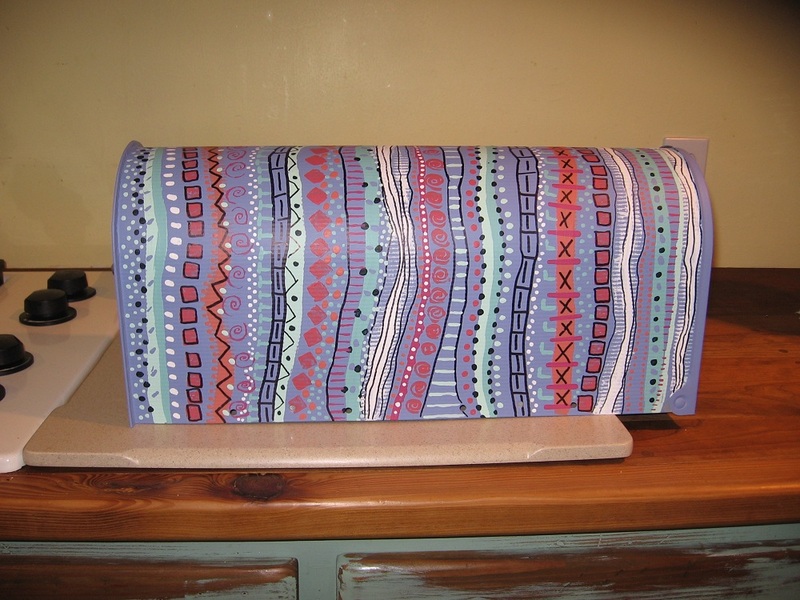 Creating designs for communication boxes, formerly known as mail boxes. I believe these inexpensive Home Depot purchases can be used inside the home and can deliver all kinds of messages. 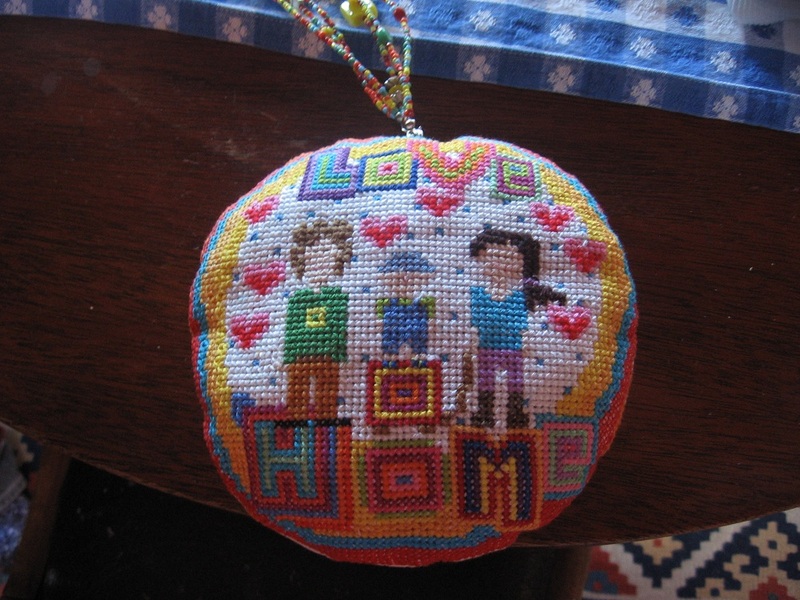 Cross-stitch a “teri” designed pillow. This is the reason I needed a new eyeglass prescription! I added second-hand store beads for a little more color and texture. 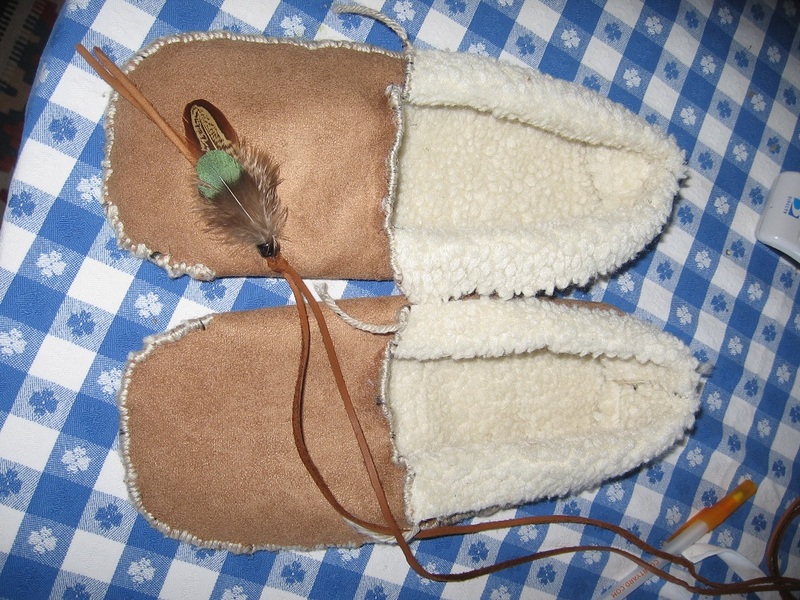 Martha Stewart design of moccasins. Martha’s design used felt. I wanted something a bit sturdier and found fur lined suede for my toe warming gift. And lastly, one of my favorites, home canned goods. 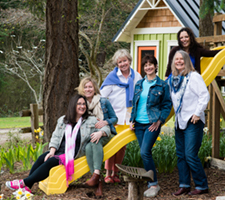 I spent an evening with close friends in Bellingham. 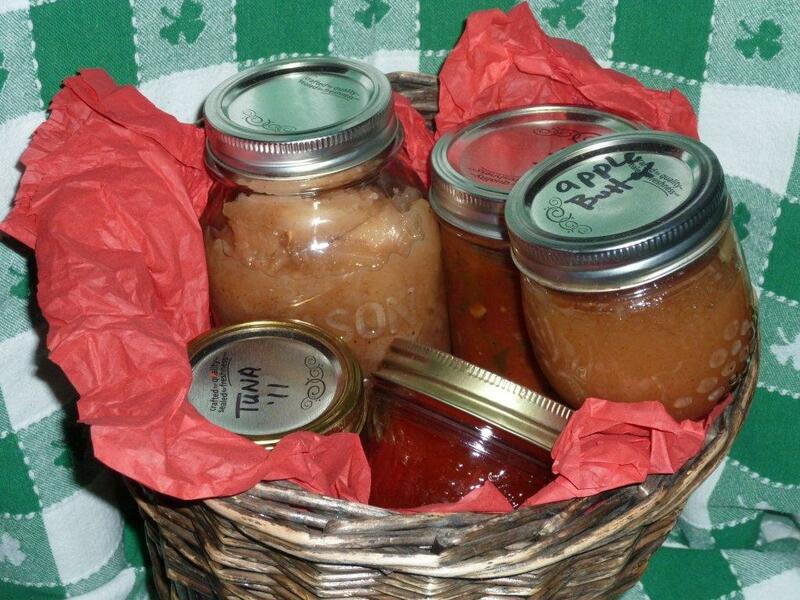 I brought them a box of canned goodies: tuna, salsa, apple pie filling, apple butter and pepper jelly. Well received!